My Japanese food vocabulary was limited to maki, sushi, sashimi, tempura and sukiyaki. Until a sudden staycation brought the gang together where we feasted on a Japanese lunch banquet good for ten persons, we’re five, by the way. 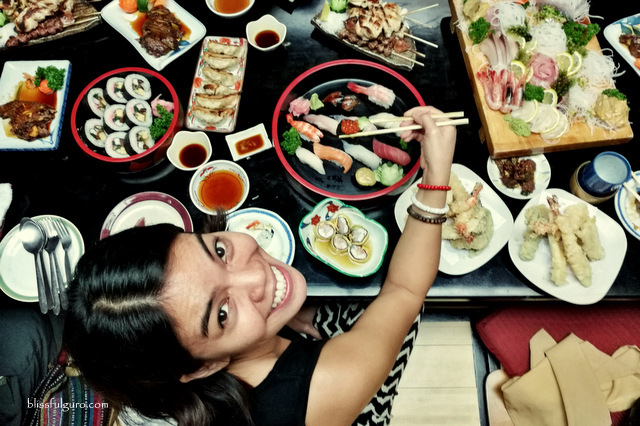 Hatsu Hana-Tei Japanese Restaurant in Makati was our rendezvous that Saturday rainy afternoon, exactly five days before our Tokyo adventure—the perfect introduction to the elaborate cuisine of Japanese people. It was weekend and all five of us were stuck in town without any trip, a rare occasion for the group these days. A sudden staycation at Herald SuitesPolaris, the newest boutique hotel in the heart of Makati’s Poblacion area, was arranged –a chance to catch up with my favorite travel buddies (check here for discounted tours, transportation and activities in Manila). The gloomy weather was pulling us back to bed. We gathered at a friend’s flat and watched as the metro got soaked because of sudden heavy downpour. It was our typical beer sesh, minus the beer. We braved the weekend traffic and arrived at our lunch place two hours past the scheduled time. We went directly to the second level of Herald Suites for our rendezvous that rainy afternoon. We were led to one of the private rooms at Hatsu Hana-Tei Restaurant. The traditional private dining room (washitsu or tatami room) was filled with Japanese knick-knacks which made it more authentic. We settled on our individual cushion square (zabuton) and were offered with hot tea. We were given the chance to chat with the executive chef, Koichi Kondo, where we learned about his humble beginnings in Japan and how he found his home in the Philippines. In the middle of our enjoyable chat, an appetizer came which followed by the grand feast. I failed to get the names of each dish but everything was absolutely great. The subtlety of the taste and the aesthetic appeal was definitely spot on legit. The gang enjoyed each and every bite of the meticulously prepared dishes. It was as if we were kids on a candy store trying to sample all the sweetie collection. Our supposed 2-hour lunch ended on a Japanese enculturation with stories from our lovely chef (who knows how to speak Filipino). It was a lovely afternoon paired with fun tales and whatnots; the perfect prelude to our Tokyo adventure.